Can One Project Redefine Power Delivery? 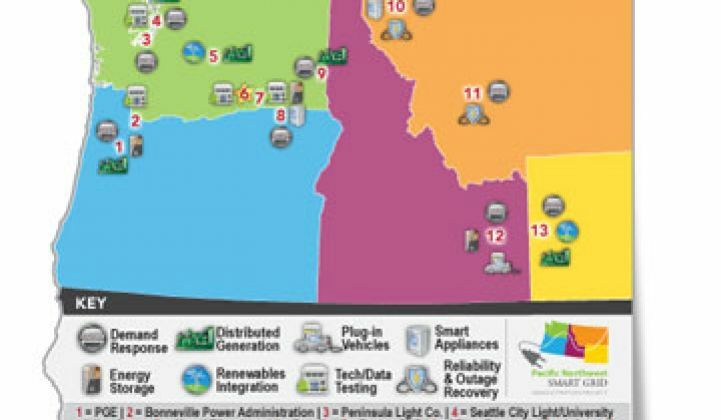 The Pacific Northwest demonstration project begins its ambitious price-based power control system. In a pocket of the Pacific Northwest, a revolution is unfolding. A U.S. Department of Energy demonstration project might not seem like the most likely place for a sea change in how power is delivered, but that might just be the case. The Pacific Northwest Demonstration Project began in 2010, but this year is when it really gets interesting. The project crosses five states, including Idaho, Montana, Oregon, Washington and Wyoming. There are many elements, but the central and most innovative piece is transactive control, a two-way communication, control and incentive system that will allow renewable energy -- namely wind -- to be balanced by distributed resources across the region. Data collection began in October across Bonneville Power Administration and eleven distribution utilities. “This is the only project in the world trying to integrate across multiple utilities to provide a regional benefit,” said Ron Melton, project director at Battelle for the Pacific Northwest demonstration project. The technology will attempt to provide about 60 to 70 megawatts of responsive resources and to validate the transactive control technique, according to Melton. The signal provides a two-way communication of what power is available, and at what price. The various participants, which represent everything from investor-owned utilities to small, rural cooperatives, each named the assets that they could provide to the project. In addition to the transactive control experiments, there are about 50 other reliability or efficiency experiments, including electric vehicles, conservation voltage reduction, upgraded outage management systems and other distribution automation projects. The most complicated undertaking, however, is the transactive control. One signal goes out to the utilities and then another feedback signal is sent back to the balancing authority in real time. The technology is meant to track the flow of power so that grid operators can determine the cost of the power delivered to any single point. “At a practical level, we work at the point between the transmission and distribution,” said Melton. During the demonstration project, the signal comes from the computers at Battelle in five-minute intervals to the utilities, where it looks like it's coming from the transmission zone. The utilities can then dispatch the signal down to the assets they’ve identified to avoid demand charges. For utilities, the assets are largely residential, not commercial. Many are using hot water heaters. Some utilities, like the community Milton-Freewater, already had a hot water heater control system in place that was popular with customers. It was so popular, in fact, that many customers didn’t even know the utility already had control of their hot water heater when they went to sign up to be a part of this project. Overall, there are about 60,000 houses involved. The signal, however, does not go directly to houses. The signal goes to the utilities, and then each utility decides how to use it. Not only is a signal going out every five minutes, but Battelle is also forecasting every five minutes. The forward forecast models the cost of power delivered and what the load behavior is expect to be. The forecast goes out 72 hours, although there is less granularity further out in the timeline. To create the signals and nodes to receive the signals, project leader Battelle has partnered with IBM, 3TIER, QualityLogic, Alstom Grid and Netezza. IBM is the lead technology partner that built the infrastructure to disseminate the signal and integrate it with the utilities’ responsive assets; QualityLogic is ensuring interoperability; 3TIER does wind forecasting; Alstom Grid will define and calculate the simulated wholesale power price; and Netezza provides data storage for processing speed and data analysis. Each utility is provided a transactive control node toolkit, said Melton. The toolkit has a model of what a node -- essentially any asset -- is meant to do and how to do a cost estimate for each resource, as well as how to estimate how each resource should shift when it receives the signal. The signal is going out to a variety of assets, including distributed generation, commercial demand response, programmable thermostats, rooftop photovoltaic, small-scale wind, plug-in hybrids, conservation voltage reduction systems and residential demand response. The project, which received $89 million in stimulus grants, is the largest of its kind in the U.S. AEP Ohio also has a smaller, stimulus-funded demonstration project that uses transactive control systems. At the end of the project, the goal is for utilities to continue to use the transactive control signal. The results from the demonstration should also embolden other utilities to look at how they can integrate smart grid technologies into their own organizations. Melton said that the reason they involved utilities of every size and type was so that results could be applicable to nearly every utility in the U.S. For utilities with changes on the supply side and more variable loads, Melton argues they all need to be looking for new ways to operate.